After becoming the first Premier League side to register 100 points last season, many fans and pundits thought that Manchester City may take a step back this season. Unfortunately for rival fans, the Citizens have been in even better form this season. Having already won the Carabao Cup, they are still in with a chance of winning the unprecedented quadruple. As things stand, they are currently favored in each of the competitions they remain in. Possessing one of the best European squads in recent memory, City are stacked all over the park. They’ve got Aguero and Jesus banging in the goals up front, comfortably supported on the wing by Sterling and Sane. You could argue this isn't even the strength of the team. In David Silva, Bernardo Silva, Kevin de Bruyne, and Fernandinho they have 4 of the best midfielders in world football. Aymeric Laporte and Kyle Walker have emerged as stalwarts along the back line, whilst John Stones and Oleksandr Zinchenko have come on leaps and bounds this season. In Pep Guardiola, they've also got arguably the best manager in world football, who is well equipped to lead the charge this season. But do they have a realistic shot at the quadruple? Let’s analyze their chances in each competition. After taking out the Carabao Cup in February, we know that City won’t go trophyless this season. They had a relatively smooth run to the title, only facing Chelsea out of the fellow top 6 sides. You could argue they were fortunate drawing Burton in the Semi-Finals, but you can only play who’s in front of you. 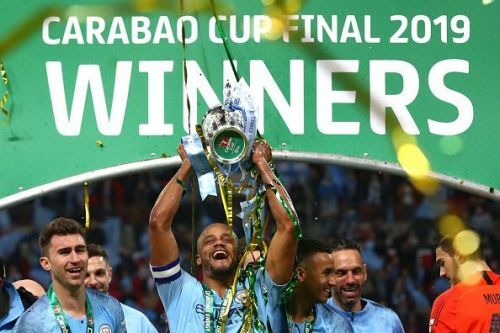 This marks back-to-back Carabao Cup wins for the Citizens, as well as 4 wins since 2013-14.